Here psychotherapist Joan Kingsley advises on how to keep the mind young. Watch out for the bit about exercise! I don’t want to say I told you so but ……..I just can’t stop myself…..I tol….phew, stopped myself. (such control huh?) And the bit about using those brain cells? Glad to see that challenging myself doing this website has done me the world of good! Joan’s words of wisdom resonate profoundly with me. I always feel that the people who stay youthful and vibrant are the ones who remain most engaged in life and live in the present instead of dwelling in the past. Eliza Jane was depressed. She had no energy and no motivation. Life had lost all meaning for her. “I’m a complete failure – have completely messed up my life and will never recover. I’ve made some terrible decisions and now it’s too late.” I asked Eliza Jane how old she was “I’ll be 23 next month”. Over the years I’ve seen lots of clients in my psychotherapeutic practice who have lost their lust for life. Whatever age or stage of life, the common theme is a belief that life has passed them by and they’ve somehow missed the boat. What I believe is that life is a passionate affair and age bears absolutely no relation to how you perceive yourself. It’s true you can’t change your age, but you can change your attitude and approach. All your thoughts, feelings and behaviours emanate from beautifully complex systems in your brain. It used to be thought that mind and body operated independently. It is now agreed that there is no mind/body split. Everything you think and feel resonates right though the whole of your body and everything that happens in your body affects how you think and feel. I am deeply interested in how the brain drives our mind and body and I believe the key to feeling young and fabulous is keeping your brain cells busy and buzzing. 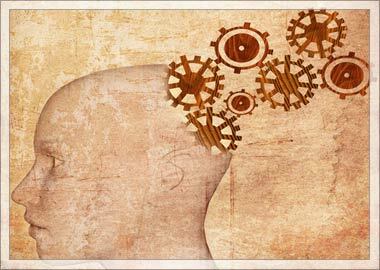 The benefits of exercising your brain are as great as the benefits of exercising your body – and the body of evidence is growing. You’ll stay young at heart with a positive attitude, a playful disposition, an appetite for learning, and a creative spirit. It’s so important to look after yourself, pamper yourself, and care about how you look. If you look good you’re going to feel good. And if you feel good you’re going to look good. Mind over matter is about developing, changing and growing. You are built to learn, adapt and evolve throughout all the years of your life. No matter how old you are you have the power to pursue goals, and to become whoever you want to be. Never, ever give up on chasing your dreams. And don’t let anyone tell you you’re too old to learn something new. Your brain embraces and thrives on change and so should you! So it’s really important to think yourself young. Be childish and playful. When you walk down the street look at the world through young eyes. Get curious. Never stop asking questions. Be spontaneous and allow yourself to be surprised by what you see. You’ll find a smile on your face and a spring in your step. Make sure you keep learning – forever. Why? Your brain is built from over 10 billion brain cells, and when you learn something new, brain cells spark and fire; signals flow forming new connections. The more you learn, the more you can learn. When you stop using your brain it stops making new cells. Wisdom isn’t magic. It’s the result of hours and hours of hard work, diligence, discipline and drive. So you’d better get busy. Develop a can-do attitude. And stay busy. Learn a new language, read books, do puzzles, learn to play bridge. I cannot emphasize this enough – good relationships are fundamental to staying young. You are the sum of the quality of your relationships – from minute one, day one relationships make you who you are. Social networks keep you vibrant and youthful. And it’s really important to surround yourself with stimulating people who make you feel alive and good about yourself. Brains stay energetic through the connections they make. We think, we feel, we act. Underpinning all three are eight emotions. Love, Joy, Surprise, Fear, Anger, Sorrow, Disgust Shame. These are the eight basic emotions and they’re part and parcel of your brain. Without them you’d die. Brought to you by at least two million years of evolution, emotions are filled with energy that motivates you to do everything you do. Suppressing your emotions switches off the energy you need to be fully engaged. Running from your feelings is exhausting, debilitating and aging. Put a damper on your emotions and you extinguish your self. Emotions and experience switch on and off brain chemicals that have a massive impact on mood, vitality and energy. Love and joy turn on the feel good chemicals like oxytocin, dopamine and serotonin. Even when you’re not feeling like it, a laugh and a smile really do work. Before you do anything important look in the mirror and give yourself a great big smile. You will feel better for it. The research is in. Exercise impacts every aspect of your physical and mental health and regular exercise helps keep you young and healthy. Keeping active boosts your immune system, fights stress, staves off depression, switches on those feel good brain chemicals. Get out and walk, Play tennis, take up golf, learn to tap dance. Just keep moving. So what happened to Eliza Jane? As the song goes, she picked herself up, brushed herself off and started all over again. She realized that she really wanted to live an international kind of life, got a job in Hong Kong, met a fabulous guy. 12 years on has a successful career, and is happily married with two lovely children.